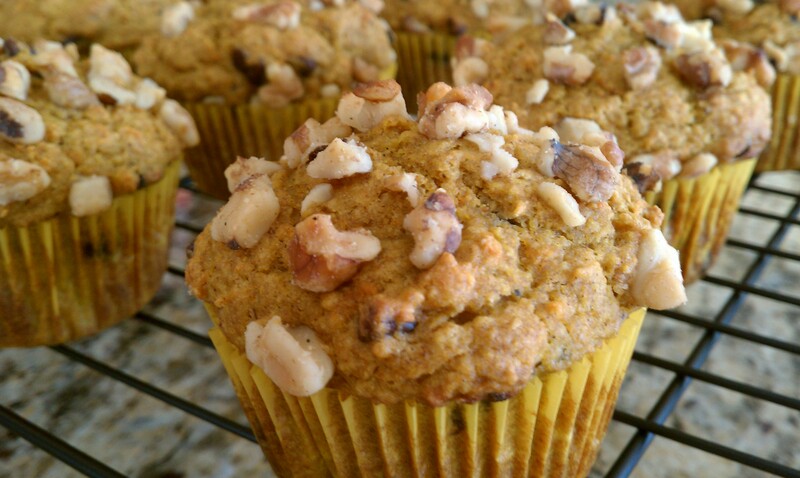 Pumpkin, banana, zucchini, walnuts, chocolate chips…yum. There is a lot of stuff in this recipe from Janet & Greta Podleski. The “Loaf of Your Life” recipe was in the original Looneyspoons cookbook, but the authors sent out a new and improved (and even healthier) version in the March 2012 issue of their Recipe Newsletter. I made this bread with my daughter Samantha, and it was great to see her fascination with grating the zucchini after telling me how “gross” it was when we picked it up at the grocery store. 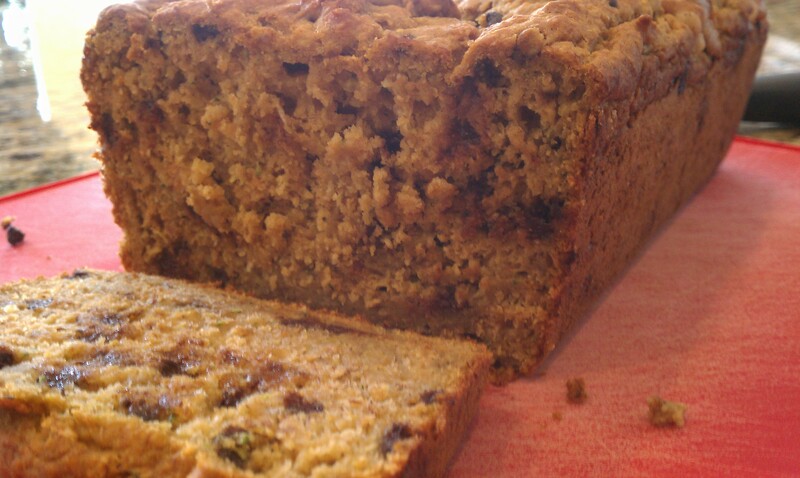 Of course, once baked into this delicious bread, she had no further issues with the zucchini. There is hope. Preheat oven to 350F. Spray a 9×5-inch loaf pan with cooking spray and set aside. Don’t use a 8×4 pan. Combine all dry ingredients in a medium bowl and mix well. In a large bowl, whisk together wet ingredients through egg until well blended. Add dry ingredients and mix using a wooden spoon just until dry ingredients are moistened. Fold in chocolate chips and walnuts. Spoon batter evenly into prepared pan. Bake on middle oven rack for 50 to 60 minutes (my oven needed 60 minutes), or until wooden skewer inserted in center of loaf comes out clean. Cool in pan on wire rack. Wrap leftovers well and store in fridge for up to 5 days; can also be frozen. In addition to it being Fat Tuesday, apparently today is also National Pancake Day. As if I needed a second excuse. 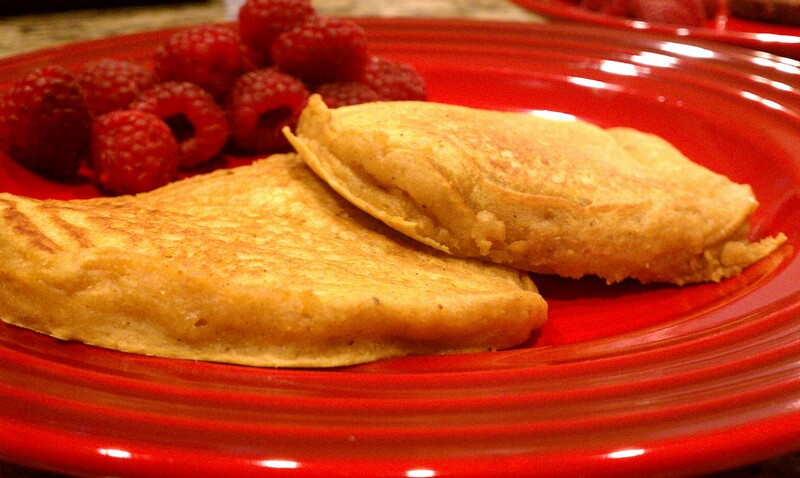 When I was looking for the perfect pancake recipe for our Valentine’s dinner last week, I came across these “Pimped-Out Pumpkin Pie Pancakes” from my Looneyspoons Collection Cookbook, courtesy of Janet & Greta Podleski. It seems that everything I have made from this cookbook has me delving into the pumpkin pie spice, but there are certainly no complaints about that. This recipe uses half whole-wheat flour (I always use whole-wheat pastry flour as it seems to result in a fluffier texture) and half all-purpose flour, plus a cup of pumpkin — so a pretty healthy and hearty pancake. I did cut back on the pumpkin pie spice a bit as my kids found it to be strong in the granola bars we made recently. As expected, the kids were thrilled with another “pancake breakfast for dinner” night. And this recipe made a ton of pancakes — we’ll be eating the rest for breakfast for sure. Preheat griddle to medium heat. Combine all dry ingredients in a large bowl — flours through baking soda. Combine all wet ingredients in a medium bowl, whisking well. Add the wet ingredients into the dry ingredients, and stir until just combined. Spoon batter by 1/3-cupfuls onto preheated griddle that has been lighted coated with cooking spray. Gently spread batter to about a 4-inch diameter. Cook 1-2 minutes per side, until cooked through (this batter is pretty thick, but be careful not to burn them). The recipe suggests serving with vanilla yogurt and pure maple syrup (we skipped the yogurt, although that sounds good too).